This entry was posted in Health and Medicine, SciBlogs, science, Science and Society and tagged Australia, dental health, fluoridation, fluoride, SciBlogs. Bookmark the permalink. Still refuse to get it don’t you Ken! It makes people sick and no one has the right to inflict toxic industrial waste on the whole population without their informed consent . . . and no council has my permission to do this to me, my family and pets. After 4 years fluoridation there was virtually no difference between that and long term, meaning fluoridation during pregnancy and for the first 3 years of life does not help. So the risk beneift needs to be redone. After 4 years fluoridation there was virtually no difference between that and long term, meaning fluoridation during pregnancy and for the first 3 years of life does not help. No, it doesn’t mean that at all. The groups of children who were 7 years old at 2008 2010 2012 had their teeth checked for decayed missing or filled teeth. (That is of course 3 different lots of children). Further they were divided into 3 groups depending on fluoridation. That is now 9 groups. They are now 7 and have either had fluoridation all their lives, or just for 4 years since they were 3 and no difference shows in DMF teeth. So fluoridation *cannot* be sold to parents. according to this study, on the basis it helps children if they experience it from pregnancy to 3 years. It is very interesting to me that this study showed a difference. 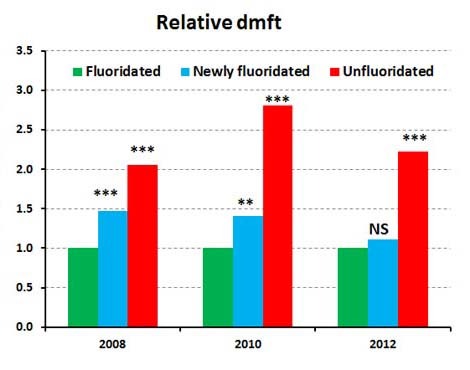 DMFT in young children is a very insensitive indicator of fluoridation’s effectiveness. This is because a tooth with a tiny cavity gets the same score as a tooth that has all surfaces rotten. It may be that enough of these kids still had their baby teeth for which DMFT will be more sensitive a measure of fluoridation’s effectiveness. For adult teeth DMFS should always be used if a fluoridation effect is being tested and the subjects need to be in their teens. The reference is in the image. Billy Budd if that is a large sample the difference at 15 must be treated as significant, What do you suggest? What software did you use to put the smooth curve on? I see I mistook 5-7 for 7. So my 3 has to change to 1-3. If children are born to mothers living in a non-fluoridated area and it remains that way till they are 1-3 they are no worse off filling-wise than if they had been born in a fluoridated area, measured at age 5-7, and hardly better if the fluoridation started when they were at 3-5 years.. Therefore if there be any risk associated with fluoridation for further subgroups it may be avoided by not administering fluoridated water till they are 1-3. It is now ethics against expediency economics. I wish they would have done other tests, cognitive and behavioral. Rather than risks associated with fluoridation the study clearly shows important risks for children living in non-fluoridated areas. Anyone concerned for children’s well-being will take that on board rather than attempt to divert with unsupported speculation. Ken, not a very scientific term, “almost” a lifetime. They have been conceived “almost” 2 – 4 years before fluoridation in Gosford, out of a conception to 2012 lifespan of “almost” 6 – 8 years. Not “almost” it’s more like 30% – 50% of a lifespan. Not sure about before conception. And there is not much difference for the 2010 group for which they were fluoridated for much less than a lifespan. I didn’t say this study is about risk. Maybe there is no risk for any genetic or say vitamin D or iodine-deprived types . Maybe there is other positive benefit besides teeth. But this study does not show benefit to teeth from early fluoridation. To go on fluoridating from conception to 1-3 is only being done for expedience. And actually it’s a nuisance since you have to relate the fluoride level of baby milk formula to whether the water is fluoridated said the RS review. 30% to 50% non-fluoridated part of lifespan, sorry. Brian, you are an extreme straw clutcher. So extreme as to be completely ridiculous. In fact with some measurements such as mean counts of untreated decayed teeth and the proportion of children who were carries free there were big reductions witching 2 years. But only an idiot would use this study to divert attention way from the beneficial effects the study shows for the well being of children by a raising a bogey of an unsupported “risk.” Incredibly idiotic. Ken I do not understand how your second graph 2008 columns are as they are. From your explanation, getting a relative figure would just be dividing by the long term fluoridated figure. That would not give the shape of your second graph 2008. Maybe they are trying to allow for other different Gosford factors? Brian. You have a comprehension problem again. I advise you to retread my article – or better still the original paper. The second figure comes from the statistical analysis – it is not a simple rearrangement of the data in the first figure – as you seem to think. Why would I duplicate the same information in two separate figures? I am wondering what else was happening to Gosford around 2010 to make such a difference between the proportion of blue to green in graphs 1 and 2. Brian, you don’t have the ability to add to my post (although I of course welcome polite requests to correct mistakes). Your problem was you own poor comprehension. The difference between the two graphs is clear in my text. As I said, there were clear and significant effects from origins, socioeconomic status and sugar consumption (not included in graph 1).. (Interestingly an effect of toothbrushing was only significant in one year). If you want to delve more deeply then you should actually read the paper instead of making unwarranted speculations. Ken, I wrote: “I add a word to your statement,” and you answered, “you don’t have the ability to add to my post,” which is not really replying to my suggestion of the added word. Your second graph does not have a title, so I assumed the sentence starting, “The following graph” is the description. I now have a copy of the study. Of course you had said which extra factors were being adjusted for in the second graph. I am still wondering how they factored to get such a large difference. You could have said they do not explain in depth. That tooth brushing is not a significant help except for one year in some sense confirms the point raised by D B Ritchie about the worry of protective pellicle removal. It also says, since young children cannot avoid swallowing, that dietary fluoride is not helping. To be more helpful the study could have listed that by Gosford &c. Do I have poor comprehension? Normal salivary fluoride is very much lower than flouridated water. Yet Urewera Maori had good teeth. I have to presume that when the went to Auckland, not only did the biscuits start to stick on teeth and stop allowing saliva to get to the tooth surface, but also more of the dietary calories were being supplied by sugar, associated in the new diet with fewer other minerals like magnesium need for healthy saliva. Brian, there is a clear section heading – the influence of other factors, and reference to the statistical analysis. Please don’t blame others for your annoying lack of comprehension. But Ken it does not give how much where, to shed some light on the large difference. Brian, I realise you are attempting to divert attention away from the findings of this study as I have reported them. Rather than do this here why don’t you contact the authors with your specific questions? Thanks Ken, my first question may be the amount of magnesium in the lime pH adjuster associated with fluoridation. NZ lime supplier tester has not got back to me on that after my call was referred to him. Gosford City Council tell me they started fluoridation in January 2008. So the children may have already had 8 or 10 months of fluoridation by the time of their first exam. And 2 years 8 or 10 months by the time of the second exam. I wonder what that will do to the graphs. Brian, you seem to be making some serious allegations against the authors of this paper so I suggest it is time for evidence. Accusations of scientific fraud should never be made lightly or by such hearsay statements. Please front up with your evidence. I am waiting for more readings but this 2007-2008 report shows fluoride commensurate with fluoridation. Isn’t that magnesium quite high? Brian, if you think the authors have made a mistake with the dates then check it out with them instead of assuming things based on a Facebook comment (which in itself could be mistaken about dates). The authors were of course intimately involved with the issue going back to before fluoridation was introduced and they need to be respected (more so than a Facebook commenter) if you are confused or have a query. They should be able to put you straight. They did not say they “went by” what was gazetted. They actually said “in 2007, Gosford City Council voted to fluoridate the water supply, and the scheme was gazetted to be implemented in December 2008.” These dates are hardly unusual, given the time taken to build fluoridation facilities. And a commenter could easily have confused a start time. (January 2009 would also not be a surprising start time). If it was fluoridated whilst going through “fluoridated Wyong”, then Gosford wouldn’t have to build a fluoridation plant for the water. Assumptions, ideas, thoughts, wonderment, all suggest that you haven’t read the paper. Thanks Stuart, I hadn’t read the Mangrove Creek article properly. I see that dam provides 93% of the *storage*for the area, not the flow. And though in the map it looks as if the take off from the dam goes towards Mardi, I see that is a new two-way pipeline. Actually it also goes along the creek to the weir and to Somersby. Mardi is also supplied from the Wyong river when flowing enough.The two plants are said to have similar capacities. Can you comprehend about the big pipelines connecting Somersby and Mardi, going through populated area? Maybe Wyong was supplied from Somersby when the Wyong river was low, until the tunnel from Mangrove Creek to Mardi was finished in 2012. Which could mean some of Wyong had less fluoride at times. Help, please, my Gosford adviser is not back till Monday. “Regarding your question re fluoridation commencement date in separate email, I confirm that fluoridation of the Gosford City town water supply began on 7 January 2008. That changes my position a bit in that fluoridation started a bit earlier for those whose teeth benefited. The study would show a shorter time from conception to start of fluoridation that showed no use of fluoridation happening in terms of results at 5 – 7. Your first graph also shows a small movement in the expected direction though no significance attached, if there were it would speak for more rapid effect than they claim. I am wondering how it affects the “relative dmft” calculation. Brian, have you had a reply to your same query of the authors? No Ken I have been waiting to get the data together. Brian, if you are interested in getting to the bottom if this you are obliged to put the same question to the authors. It is not a matter if “getting data together.” I say this because a spokesman for a council may simply be quoting from a document which is incorrect and may be a recent employee whereas the researchers were involved from early on. You come across as not wanting to check the facts on this. I seldom get replies from study authors. I was able to point out a fault in fluoride level for one year which is acknowledged below. Can you see others? A puzzle is that the Somersby plant which supplies Gosford is said to alkalise with sodium carbonate rather than calcium carbonate, so it needs a bit of thinking if there may be a mistake there, too. Thanks for the clarification. I can provide data in the same format as it is on the website. Please find below links to all published results summary reports available on Council’s website. Annual Drinking Water Quality Report 2013/14. All reports are based on a financial year – from 1 July to 30 June. The 2007/08 report includes data both pre and post fluoridation. When interpreting the data, please note that there were changes to the treatment process in 2008 to increase alkalinity. Please also consider that water quality varies through time due to different source waters, rain events and treatment plant operations. In response to your question regarding the apparently low fluoride value in 2013/14, I advise that there was a typo in the 2013/14 website summary report. This has now been amended. 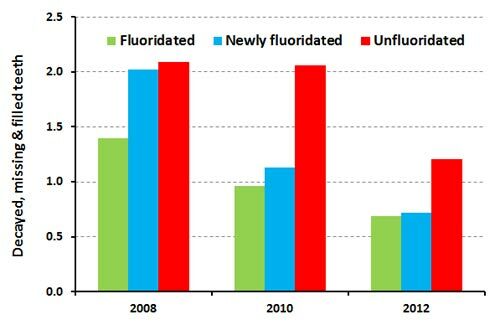 The average fluoride concentration was 1.0408mg/L in 2013/14. Regarding your question re fluoridation commencement date in separate email, I confirm that fluoridation of the Gosford City town water supply began on 7 January 2008. The Gazette approval required Council to commence fluoridation before December 2008. At the start of fluoridation a bit of a drop in magnesium, and a drop in calcium but more than a recovery. Brian, you won’t get a reply if your don’t send the request. Brian, have you communicated with the authors yet? Or are you just too busy with your flights of fancy?